20 startups from emerging markets and fast-growing startup scenes including Bangkok regional winner Chilindo will compete to win a $500k equity investment. GENEVA, SWITZERLAND – January 21st, 2014 – Seedstars World (SSW), the worldwide startup competition in emerging markets and fast growing startup scenes is two weeks away from its final event. Seedstars World team travelled to 20 different cities in 2013 to bring back to Switzerland on February 4th 2014 the best entrepreneurs for a grand final and conference. Nearly a thousand startups applied, but only one will win an equity investment of up to $500k. “When we think about successful and innovative projects, we automatically think ‘Silicon Valley’. But what about the rest of the world? There are plenty of untapped opportunities and thrilling startups hiding around the world who just need to be discovered. Seedstars World is filling this gap with a worldwide competition focusing on emerging markets and fast growing startup scenes, allowing these startups to climb on the stage and get the attention they deserve” said Pierre-Alain Masson, Seedstars World co-founder and jury member. Seedstars World travelled the world during 10 months in 2013. With the help of regional partners, the travelling team held pitching events in 20 cities: Moscow, Dubai, Baku, Accra, Kigali, Lagos, Nairobi, Cape Town, Bangalore, Bangkok, Singapore, Hong Kong, Beijing, Seoul, Tokyo, Sydney, Mexico City, Santiago, Buenos Aires and Rio de Janeiro. Up to 100 startups applied per country, through an invitation-only registration process, and only up to 20 per event were selected by Seedstars World with the support of their partners and international experts, to pitch their ideas. The winners of the regional pitching events have been invited to come to Switzerland to participate in the final competition. During its journey across the world, Seedstars World held pitching events throughout Asia and staged in Bangalore, Bangkok, Singapore, Beijing, Hong Kong, Seoul and Tokyo. The team discovered the great potential of early-stage startups across the region, the strong tech ecosystems many Asian governments and society are building and got to know the entrepreneur mindset of Asia’s startup scenes. The winner in Bangkok was Chilindo, an online auction platform for the South East Asian market. Chilindo will be in Switzerland in two weeks to compete with the other regional winners from Russia, Asia, Africa, the Middle East and Latin America. 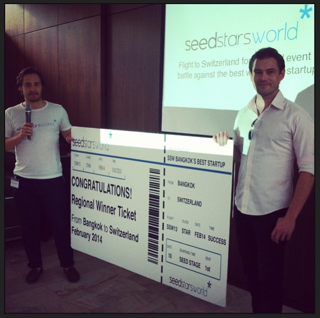 The final competition of Seedstars World will take place in two stages in Switzerland. The 20 selected startups will go first to Lausanne to participate in a 2-days bootcamp at EPFL university – ranked 8th in the engineering and technology field in the world (2013) – to learn how to perfect their pitches. Accelerators including the Singapore-based Business Strategy consultancy Galixo will coach and mentor the finalists. The semi-final will be held at the world renowned MBA school, IMD– part of the Financial Times top 20 school (2013) – where the 5 finalists will be selected by a high-level and distinguished jury panel. Alex Farcet, Stefan Glänzer, Martin Velasco, HendrikBrandis, Colin Turner, Marco Corradino and Pierre-Alain Masson (co-founder of Seedstars World). The event will close with the projection of “Crocodile in the Yangze”, the story of China’s first Internet entrepreneur, Jack Ma Alibaba.com Founder. Porter Erisman, VP of Alibaba.com, will be on stage for a live Q&A session. G-Startup Beijing Approaches Deadline on April 8th! Apply Now!